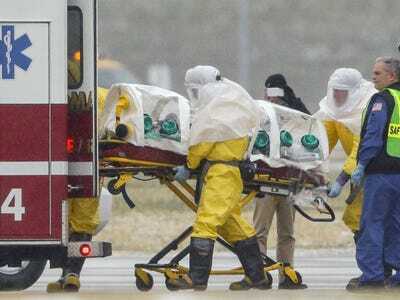 Nati Harnik/APHealth workers in protective suits transport Dr. Martin Salia from a jet that brought him from Sierra Leone to a waiting ambulance on Saturday. Salia died about a week after learning he had the disease. A surgeon who was being treated for Ebola at a Nebraska hospital has died, according to WOWT 6 News. Dr. Martin Salia was a Sierra Leone citizen with permanent US residency. He lived in Maryland while he was in the US. Salia was working in Sierra Leone medical facilities when he contracted Ebola. He learned he had the disease last Monday and arrived at Nebraska Medical Center in Omaha on Saturday “extremely ill,” according to CBS News and the Associated Press. Sierra Leone is one of the West African countries at the epicentre of the Ebola outbreak, which has killed more than 5,000 people. Ebola often begins with flu-like symptoms and a fever and can progress to internal and external bleeding and organ failure. Nebraska Medical Center said earlier that Salia came to the US sicker than other patients who had been successfully treated for Ebola here, according to the AP.